At Perry Aire Services we carefully choose the products we put in your home or business! We use almost all of the largest companies. No one company makes everything and no one company has all of the best equipment! If I will not put it my home or office, I will not put it in yours! 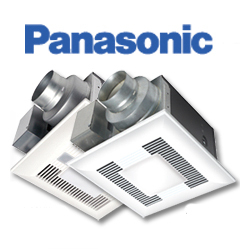 Panasonic is one of our highly recommended and used products. If you are located in the Arlington, Alexandria, Fairfax, Fredericksburg, Prince William, Spotsylvania, Stafford, Vienna, Woodbridge, Virginia, and Washington DC, Maryland areas and have any questions about Panasonic products please contact us today! Our electricians use Panasonic for the following electrical repair services! At Perry Aire, our professional Arlington, Virginia, Washington DC, Maryland electricians use high quality Panasonic electric products!